Polishing is a critical step in finalizing a sword. When i say polishing, I don't mean sharpening. 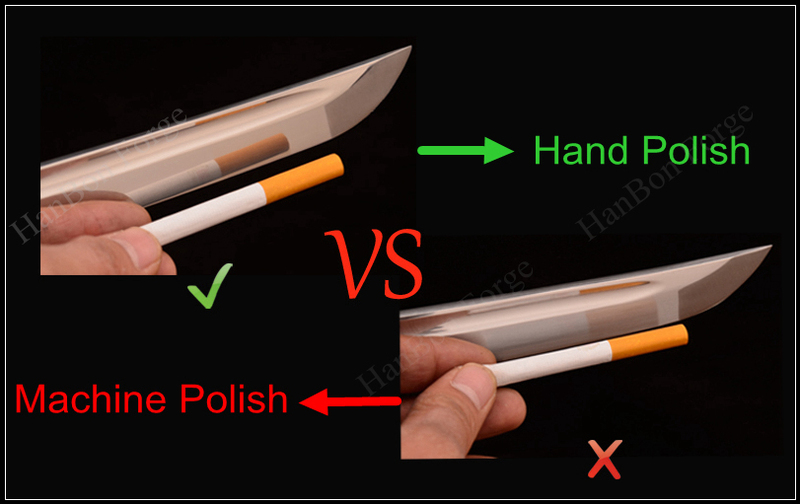 When the rough blade is completed, the swordsmith turns the blade over to a polisher called a togishi, a good polish can greatly improve the beauty of a blade, while a bad one can ruin the best of blades. In the old days, the togishi traditionally used three types of stone to polish a sword. Today, however, togishis use more than a half dozen. On high quality blades, polishing takes longer than actually forging the blade, with a typical polishing job taking about 2 to 3 weeks. It's a time-consuming and methodical process, which is a specialist known as a togishi who's responsible for this task. There are three kinds of blade polishing: standard polishing, mirror polishing, hazuya polishing. Polishing provides 'insight' into the sword's production. A well-polished Japanese sword can reveal a variety of information about the way in which it was produced. For instance, it reveals how fast (or slow) the cutting edge was cooled; at what temperature the blade was cooled; and even the carbon content of the steel itself. Of course, these findings are only visible in well-polished blades. If the blade was not polished or poorly polished, you can't identify these characteristics.